Klock Werks Flare 8.5 Windshield Dark Smoke for 14-19 Harley Touring FLHT FLHX. Wind tunnel designed and tested, the "hips" provide added downforce while the flip at the tip directs air over the rider to help eliminate the swirl of air found in front of the rider on standard windshields. Lexan® Polycarbonate with FMR hard coating is used to create these custom-molded designs with unmatched durability. All are predrilled for easy mounting using stock windshield hardware. CVO Electra Glide Ultra Limited FLHTKSE. Electra Glide Ultra Classic EFI FLHTCUI. Electra Glide Ultra Classic Low FLHTCUL. Electra Glide Ultra Limited FLHTK. Electra Glide Ultra Limited Low FLHTKL. Tri Glide Ultra Classic - FLHTCUTG. Tri Glide Ultra Classic FLHTCUTG. The item "Klock Werks Flare 8.5 Windshield Dark Smoke for 14-19 Harley Touring FLHT FLHX" is in sale since Tuesday, June 9, 2015. 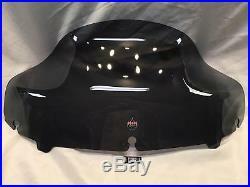 This item is in the category "eBay Motors\Parts & Accessories\Motorcycle Parts\Body & Frame\Windshields". The seller is "jtscycleparts" and is located in Cobleskill, New York.